(Photo: REUTERS / Gabriel Bouys / Pool)Pope Francis (R) talks with U.S. President Barack Obama as they exchange gifts during a private audience at the Vatican City March 27, 2014. VATICAN CITY (Reuters) - U.S. President Barack Obama heard the Catholic Church's concerns over his health care plan while on a visit to the Vatican on Thursday, but drew a cheerful response from Pope Francis when inviting him to visit Washington. The president appeared at ease and joked during the parts of his meeting with the pope that were open to a few reporters, but a brief Vatican statement issued later indicated that Obama's private talks there had a more serious side. The statement said Obama, who was accompanied by Secretary of State John Kerry, was told of the Vatican's concern about "the exercise of the rights to religious freedom, life and conscientious objection" in the United States. This was a reference to the mandate in Obama's controversial health care plan which requires employers to cover the cost of contraception in insurance plans. Catholics and members of other religions say the mandate, which is the subject of more than 100 law suits across the United States, is a violation of their beliefs because it forces them to support contraception and sterilisation. Obama later told a news conference in answer to a question that the pope "did not touch in detail" on the health care act but that it was discussed more in a separate meeting with Vatican Secretary of State, Cardinal Pietro Parolin. "I pledged to continue to dialogue with the U.S. Conference of (Catholic) Bishops to make sure that we can strike the right balance," Obama said. He acknowledged that there were differences of opinion between himself and the pope on a number of issues but said the pontiff could be an inspiration to politicians. "His job is a little more elevated. We're down on the ground dealing with the often profane, and he's dealing with higher powers. I do think that there is a potential convergence between what policymakers need to be thinking about and what he's talking about," he said. The Vatican statement said the topics discuss included "current areas of conflict, which Vatican officials said was a reference to Ukraine and Syria. Obama said the major domestic issue he discussed with the Pope himself was his drive to get immigration reform approved in the U.S. Congress. They also discussed poverty, inequality and conflicts in the world. When he entered the Vatican, Obama walked past the frescoed halls of the Apostolic Palace to the entrance of Francis' private library. "It is a great honour. I'm a great admirer," the president said as the pope greeted him and they sat at the pontiff's desk. "Thank you so much for receiving me." Obama invited the pope to visit the White House and gave Francis a symbolic gift of seeds of fruit and vegetables from the garden of the presidential residence. "If you have a chance, you can come to the White House and you can see the garden," Obama told Francis as he was explaining the gift to him. In all, Obama spent nearly two hours in the Vatican, nearly half of it in private talks with the pope. He held a separate meeting with Cardinal Parolin. 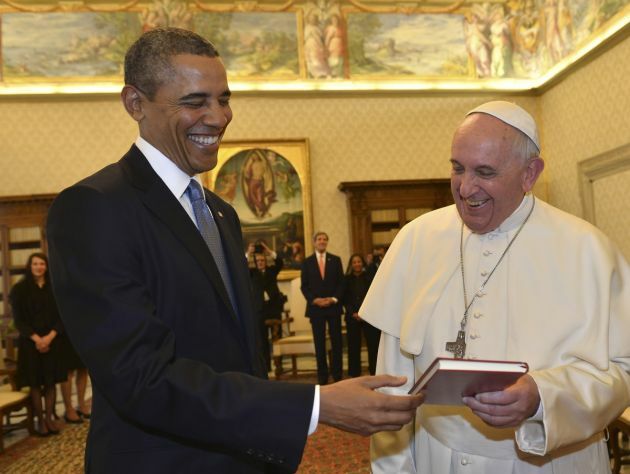 The pope gave Obama two commemorative medals and a red leather-bound copy of Evangeli Gaudium (The Joy of the Gospels), a document Francis wrote last year which is seen as the road map for his papacy. "You know, I will probably read this in the Oval Office when I am deeply frustrated and I am sure that it will give me strength and calm me down," Obama said. The pope responded in English: "I hope". Francis has turned his back on much of the traditional formality of the Vatican but he deployed the full weight of state ceremonial, welcoming Obama outside the official library, which he now uses only to receive visiting dignitaries. The pope has given up the spacious papal apartments for more modest quarters in a Vatican guest house.